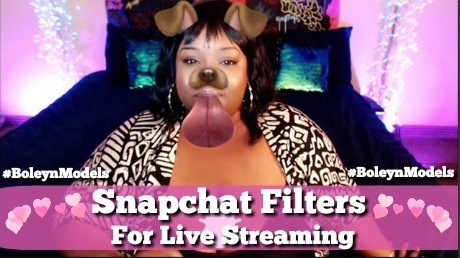 The latest rage in cammodel streaming is Snap Camera from Snapchat, plus beauty filters! Alright beauty filters aren’t exactly a new thing for live streams, but Snap Camera is! After several inquiries hit my inbox for tips on filters also known as LUTS, I decided to test them out for myself over the weekend. The two major camsites that I tried the new Snap Camera with were two of the most popular sites within the Boleyn Models Daily Pay network, Streamate and MyFreeCams. Before I get into how the effects worked during my live stream, let me explain what Snap Camera is. There’s a very big chance that you’ve already seen these fun filters in effect on gaming platforms and top camsites, but were a bit unsure on how to find them. Snap Camera lets you apply Lenses to your face while using your computer’s webcam. Utilize Snap Camera in your favorite third party live streaming or video chat applications by selecting Snap Camera as your webcam device. It was extremely easy to get set up and many will be pleasantly surprised that you won’t require a super powerful computer in order to use these filters. The Snap Camera website states that the minimum requirements are: Intel Core i3 Processor 2.5Ghz or AMD Phenom II 2.6Ghz with 4 GB RAM; Intel HD Graphics 4000 / Nvidia GeForce 710 / AMD Radeon HD 6450. You must have a screen resolution of 1280×768 or higher. All of this is fairly easy to obtain and something most cammodels are already accustomed to. This is especially true if you stream live on Streamate or MyFreeCams. Snap Camera is basically a virtual webcam on your computer and can be selected in most any program like OBS and Skype. If the application supports webcam input then Snap Camera should be able to work during your live stream. When you’re using the OBS encoder you will need to add this feature as you would add a source. It’s so easy just like when you would add a new Logitech C920 as a video capture device in your OBS Studio. Overall my engagement while using the beauty lenses were very high resulting in viewers sticking around in my chatroom. I will say that there are few negatives to using Snap Camera but those are mostly due to specific filters used. I would say it’s best that you do your research ahead of time to decide which lenses are the most flattering. As you can see in my video above some filters were best left alone and less than favorable. If you like this idea and would like to learn more tips on how to add more drama to your stream check out Cinematic Filters In OBS For Webcammodels. You can also leave a question in the comment section underneath this article. Please be sure to follow us on twitter @BoleynModels to stay up to date on all the news from our daily pay studio.